Parsnip Restaurant & Lounge, located in the heart of Harvard Square, offers globally-inspired, ingredient-driven cuisine in a contemporary and relaxed setting. Opened in the winter of 2015, the elegant, two-story restaurant serves new American fare with influences from countries in Europe and along the Silk Road. The intimate bar overlooks the main dining room and features approachable wines from New and Old Worlds and classic cocktails specializing in the martini. The restaurant is housed in an iconic building reinvigorated with modern aesthetics and views overlooking Winthrop Park. Its stylish and contemporary elegance reflects owner Dr. Gerald Chan’s personal vision. Guests are welcomed to the high-ceilinged and spacious dining room, tastefully decorated in a minimalistic style. The neutral color palette of grays with teak wood detailing is offset by pops of burnt orange and brushed brass. The tables were custom fabricated from old growth forest trees, all sustainably sourced (the same wood for renowned Danish restaurant NOMA), and the chairs from Cassina in Meda, Italy. Flooring is made from white American oak and the white marble stonework at the bar and along the side tables was sourced from South Africa. An elegant fireplace sets the ambiance in the exquisite restaurant during the winter months. Parsnip can easily accommodate a variety of functions from small intimate groups to large celebrations, business meetings, and social parties in each of its spaces. Events can be held in the restaurant’s main dining room or in the versatile private area overlooking Winthrop Park. Alternatively, the dedicated event space located on the 2nd floor offers a stylish and casual atmosphere with two fireplaces, eye-catching vintage furniture, brown and burnt orange colors adorning the walls, ambient lighting, a dedicated kitchen and a full custom bar. Embracing his Filipino heritage, Executive Chef Jeffrey Salazar was inspired from a young age by his hardworking mother who made delicious, home-cooked meals for her family of six every evening, as well as by the TV shows of Julia Child, Martin Yan, and Bobby Flay. Originally from New Jersey, Salazar graduated from Johnson & Wales University with an Associate Degree in Culinary Arts and a specialist certification in sports nutrition from the International Sports Science Association. He began his culinary career under two mentors in Providence, RI, Chef Jules Ramos and Chef Ashirwad Elhence, with whom he developed his skills and expanded his repertoire. He moved to New York in 2013, working at a string of established restaurants including the Caribbean-inspired Cove Lounge in Harlem as Executive Chef as well as under chef Bobby Flay at GATO Restaurant and Bar Americain. In 2018 he joined the team at B3 – Back Bay Beats in Boston, a warm and hospitable restaurant where, in addition to great food, guests can enjoy performances by talented musicians from the world-renowned Berklee College of Music. Spearheading an entirely new Southern-influenced menu, Salazar’s plates are honest, approachable and ingredient-driven. 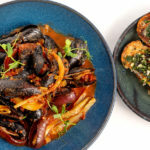 His dishes reflect his commitment to showcasing the Southern regions of America and the rich food culture of New England, where produce and fresh seafood are sourced from local farmers and fishermen. Complementing the team’s down-home dishes are home-style desserts, all using traditional recipes and seasonal ingredients. As the Executive Chef at Parsnip, Salazar is re-imagining the menu to offer New American, seasonally inspired, and ingredient-driven cuisine in the restaurant’s contemporary and relaxed setting. The menu reflects his approachable and outgoing personality and pairs some of his favorite ingredients together with his Asian heritage. Along with cooking, his other greatest passion in life is basketball. Whether on or off the court, he expects his teammates to give their all, to work with and for the team, to have the drive to keep pushing forward, and to keep learning new skills.